Friends! Thank you all so much for your sweet words about our kitchen reveal last week! I was so excited to share our space with you that I went ahead and did the reveal first and then wanted to come back and touch on some of the DIY projects we did along the way. 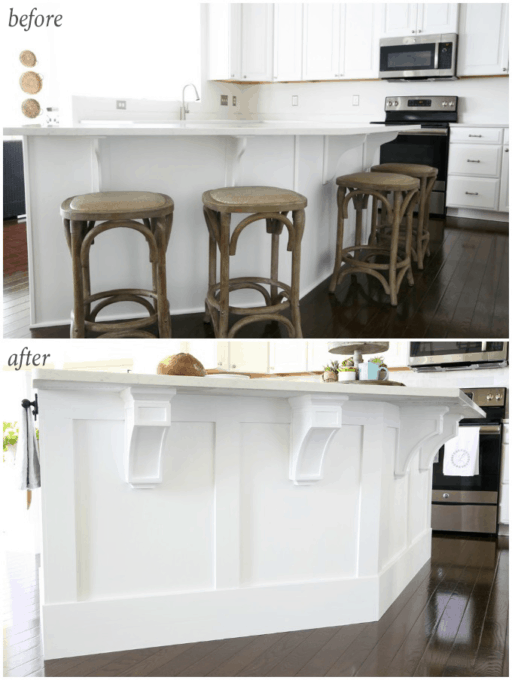 One of the most noticeable changes was the upgraded trim on the kitchen island. 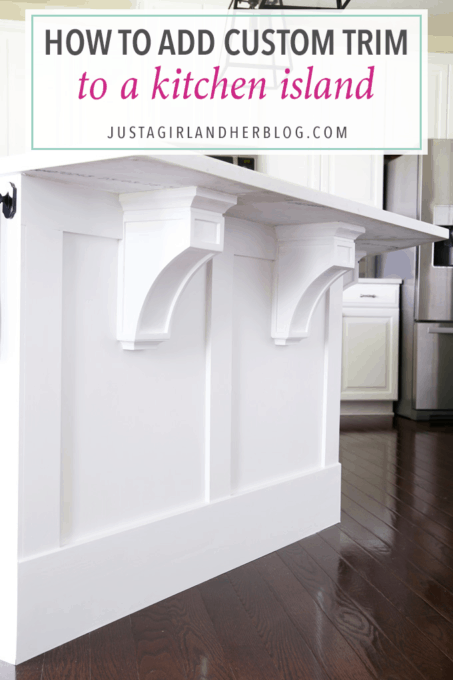 The corbels looked a little dated to me, and since the island is large and a focal point in the kitchen, I knew I wanted to beef up the trim work as well to make it more substantial. Fortunately, Donnie is awesome at installing trim, so we made a plan and he set to work! A huge thanks to Osborne Wood Products for providing the corbels for this project. This post contains affiliate links. For more information, see my disclosures here. The first thing we did was remove all of the previous oh-so-flimsy trim from the island, giving us a blank slate to work with. We then began installing the new trim. 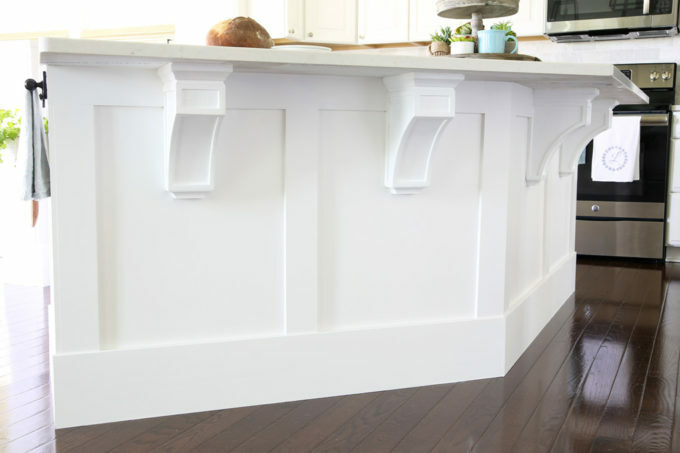 We used 7 1/4″ tall craftsman style baseboards from WindsorONE at the base of the island. Because the island has a non-right-angle in the middle, Donnie had to use a carpenters protractor to find the correct angle. Then he divided that number by two when setting up the miter saw for the cut. The mitered corner came together nicely. 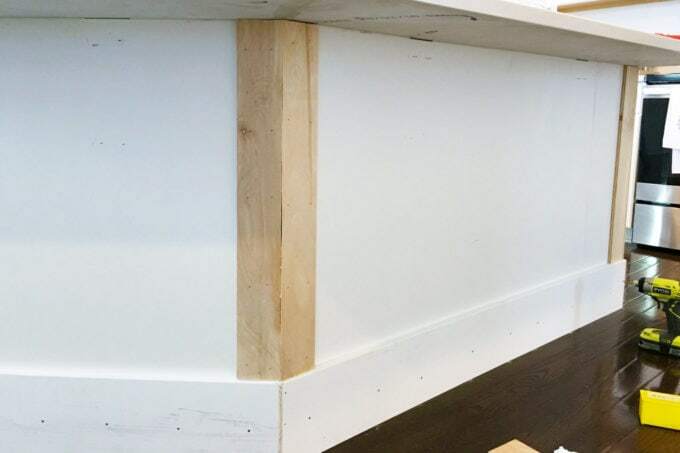 We had originally planned to use 1×4 flat stock for the vertical trim pieces, but realized that they would then be even withe the edge of the counter on the ends of the island, eliminating any overhang. 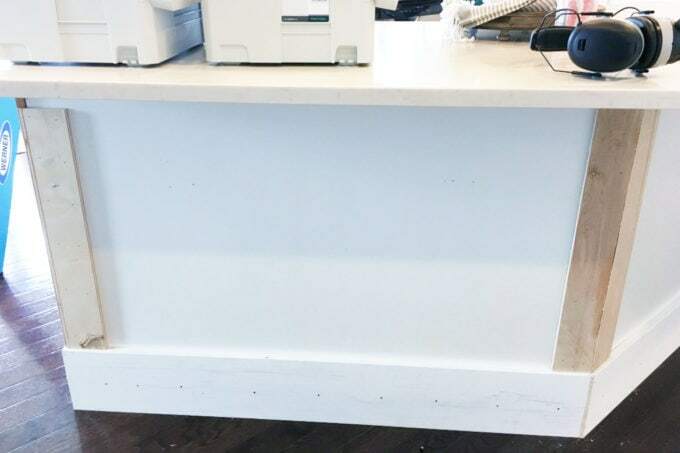 We didn’t love how that looked so instead, Donnie ended up ripping down pieces of 1/2″ plywood into 3.5″ wide strips, giving us the vertical pieces we needed and also adding some extra dimension. Before we added the trim pieces right below the countertop, we had to install the corbels. 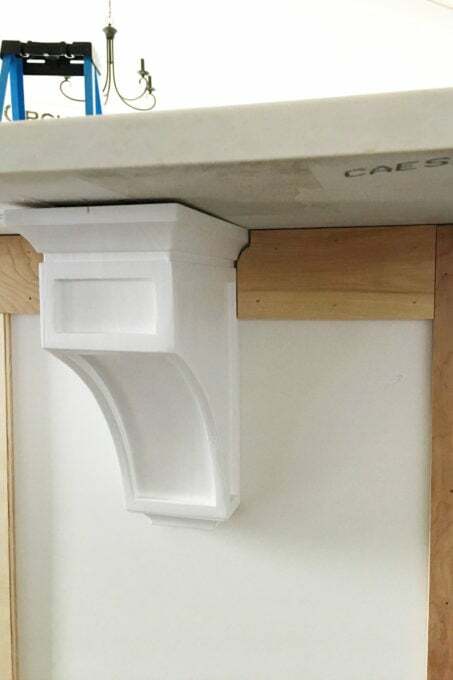 We decided to go with the Verona Mission Corbels from Osborne Wood Products, which were so much more substantial than the old corbels and gave us the exact look we were going for! We painted them white and let them dry completely, and they were ready to install. 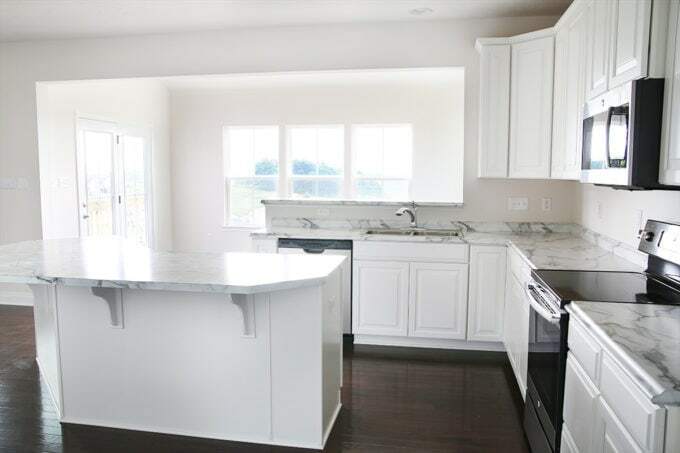 We debated about placement for a while, but because of the unique shape of our island, we decided it would be best to simply install the new corbels where the previous corbels had been. 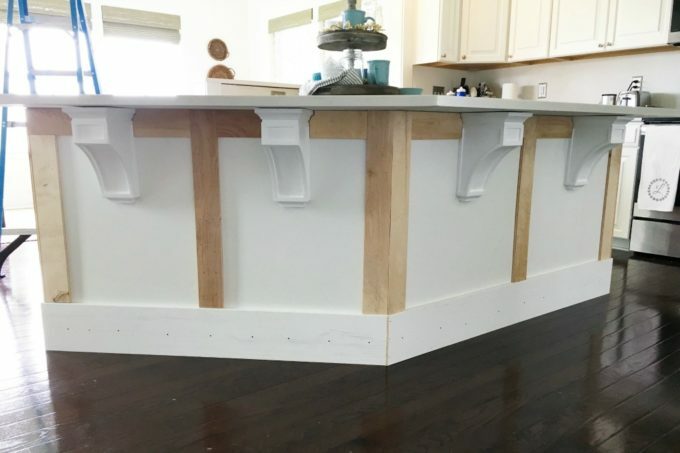 To install the corbels, we needed to anchor them from behind (inside the cabinet) using cabinet screws with a wide, flat head. It was a little tricky getting everything lined up but using a level and ruler, we were able to mark three drill holes on the outside of the island for each corbel (1). Donnie then pre-drilled through the island from the outside (2). I held up the corbels in the exact right spot (3) while Donnie climbed into the island and first pre-drilled into the corbels (4) and then anchored them using cabinet screws. The screws pulled everything in nice and tight. 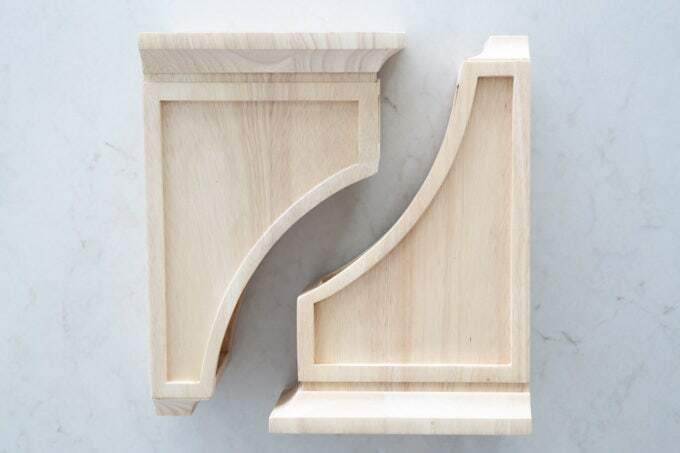 Once the corbels were in place, we could add the final trim pieces, which Donnie also cut out of plywood to match the corbel profile. He used a protractor to scribe the corbel edge profile onto his plywood strip and then used a jigsaw to make the cut. So all of the trim was installed, but that was actually only half the battle! Then it was time for filling all of those little nail holes and seams! This was my contribution to the island project. 🙂 I spent a few hours with Downton Abbey playing in the background, filling and smoothing every little hole and space. 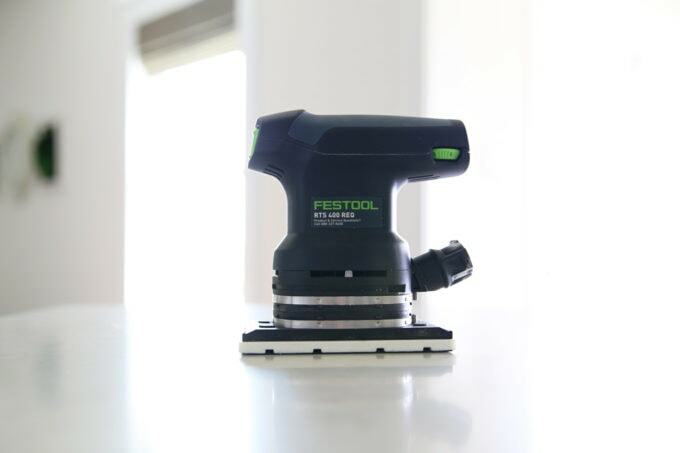 To make sure our trim was as smooth as possible before we painted, Donnie used his orbital sander to level everything off. It has a built in dust collection system so that we didn’t make a huge mess all over our kitchen or damage our lungs in the process! 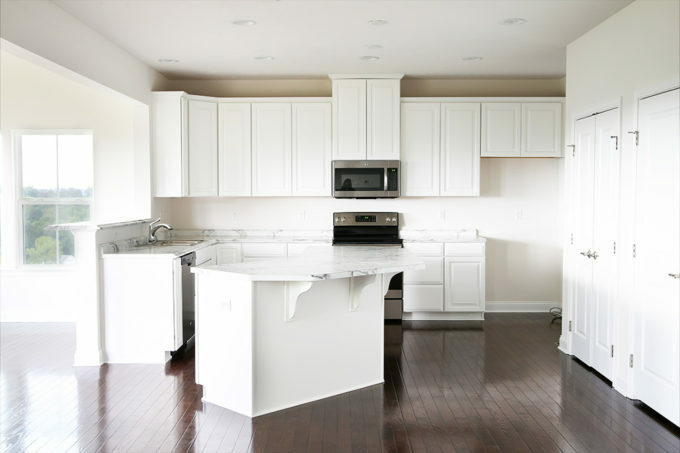 We then primed and painted everything using Behr Marquee Cameo White in a satin sheen. And I am LOVING how it turned out! Trim work just adds so much charm and character to a space, and in a new build, we’ll take as much character as we can get! I love it!! I will be back next week to share more of our kitchen DIYs! Have you tackled any kitchen projects recently? I’d love to hear about them in the comments! Hi Abby…. We are just going to start redoing our island. When you ripped the plywood for the vertical pieces how did the edges look. 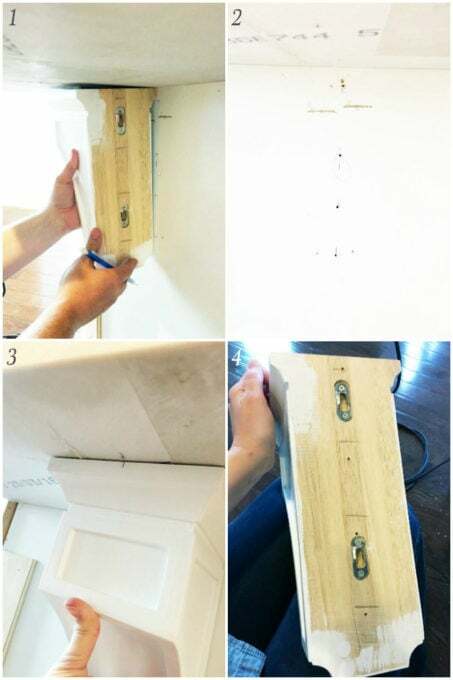 Sometimes plywood doesn’t have a smooth finish when ripped like a 1×4 would. thanks for sharing. Your island looks beautiful!!! The edges look good but I know what you mean about some plywood. I used a really nice jigsaw with a zero clearance insert to make a splinter free cut. I clamped another board as the guide to keep the cut straight. I had a few places where the different layers of the plywood chipped out on the side and I just filled those little holes with wood putty. Wow! What a huge difference! I love it so much! It definitely stands out more! Aw, thanks so much, Michelle! I do too! The hubs did good! 🙂 Hope you’re having an awesome week! 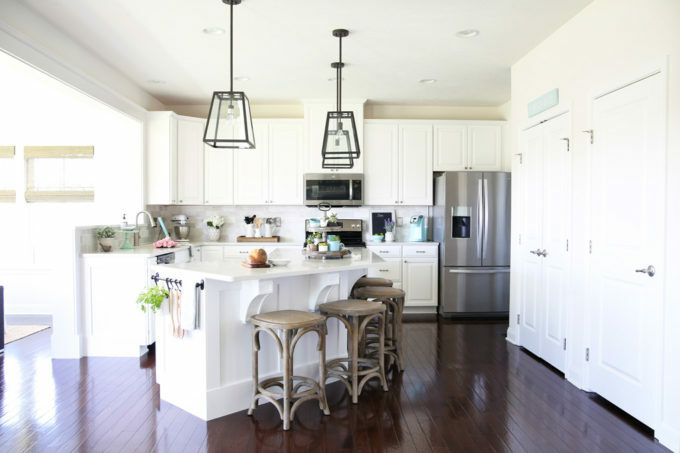 Wow your kitchen looks fabulous! What’s truly amazing is that you guys did it by yourself. Thanks for sharing the tips! I love this Abby! 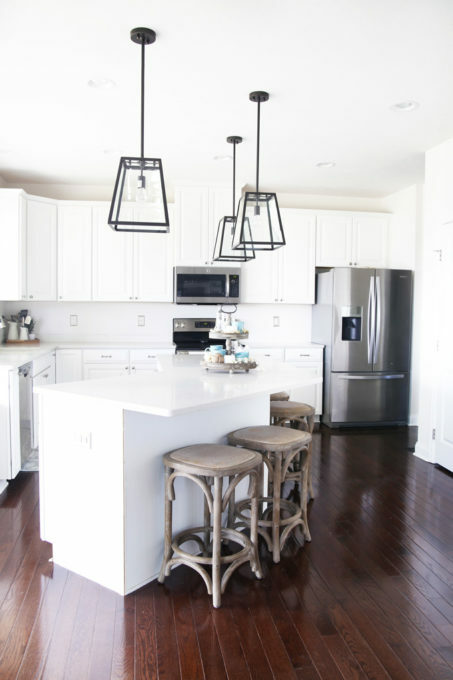 Haven’t completed a kitchen project lately, but this makes me wanna redo my kitchen just so I can do this! It turned out great! At the risk of sounding like a broken record I LOVE this! I love the in depth tutorial as well. It may wait a year or two but I believe I will be pinning this to my new house board as well. I a bit picky. It took 10 years to choose a kitchen table and 5 to choose sofas, 7 for a bedspread set. So he probably right but I simply love the changes and decor choices you ha ve made so far. They are perfect for the clean slate all white house we have chosen. Correct! 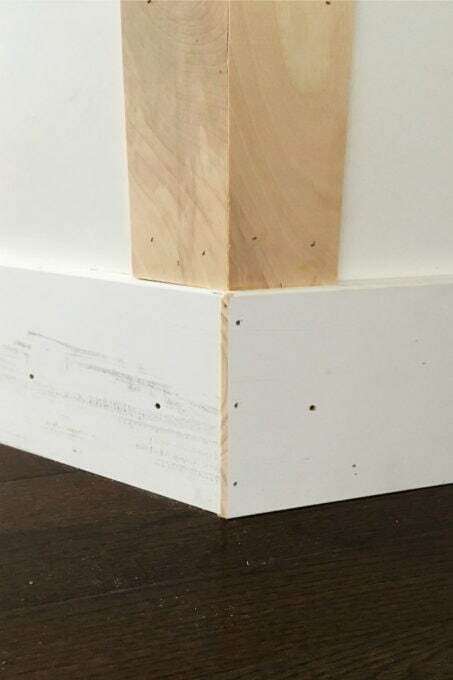 As we mentioned in the post, the baseboard is a craftsman style baseboard, and then we used ripped down plywood for the verticals so that they would be thinner. I hope this helps! Best of luck with your project!